Whether you are going through a family law matter or facing a criminal charge, our attorneys at the Kroener, Hale & Penick Law Firm here in Batavia, Ohio, can help. We use our combined legal experience of over 20 years to protect your rights and make sure that you tell your side of the story. Our attorneys regularly handle cases concerning divorce, child custody and support, division of assets, domestic violence, assault and aggravated assault, drug offenses including trafficking, theft, burglary and robbery. When a dispute rises between romantic partners or family members, the atmosphere is one of highly charged emotions, accusations and even revenge. Perhaps your spouse cheated on you, has became addicted to alcohol or drugs, abused you or your children, or the two of you just can’t be in the same room without getting into a fight. Our law firm staff sits down with you and provides you with information on how Ohio laws work in these matters. If you have been arrested and charged with committing a crime, you are in a position where you are reacting to the allegations made against you. One of our goals in your free initial consultation is to ease the concerns and worries you have. We explain to you how the criminal justice system works and what your rights are under the law. Then we look at the factors involving your case, and your personal history, to determine the right course of action for you. Dealing with a personal legal matter is a sensitive issue, and at Kroener, Hale & Penick Law Firm, we treat it with the respect and compassion it deserves. You don’t have to do it alone, let us guide you through the storm. Not all criminal defense attorneys are equal. Being able to examine a case, and confidently say, “I have seen this scenario before and I know how to handle it” is worth its weight in gold in criminal defense cases. 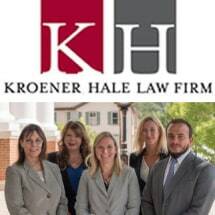 Kroener Hale Inc. has experienced Attorneys who have represented hundreds of children in the Juvenile Court. We can review the case and help you decide the best direction to proceed. Contact us to learn more about creating a will, revocable and irrevocable trusts, living wills, powers of attorney, and other estate planning tools. Our office can help you realize your goals for your assets before and after your death. Our office is experienced in representing individuals in this situation and representing them to the best of our ability. Many drug trafficking charges can result in prison sentences so it is vital that you retain a competent attorney.